Turkey has been in the news repeatedly in 2016, from the coup attempt of July to the subsequent government purges to its renewed fight against the PKK and crackdown on Kurdish populations. However surprising these developments may appear for an outside observer, they are deeply rooted in the history of the Turkish state, the evolution of the ruling Justice and Development Party (Adalet ve Kalkınma Partisi, AKP), and the complex identity politics of the region. In October, more than a dozen scholars of Turkish politics gathered at Rice University’s Baker Institute in Houston for a Project on Middle East Political Science workshop to delve into some of these underlying themes. The memos produced for that workshop have been published individually on the POMEPS website and the full collection is now available as a free download here. The authors in this collection provide rich context, new data, and sharp analysis of the nuanced challenges facing the country and the region today. The relationship between state and religion is one of the key issues to understand Turkish politics. Sebnem Gumuscu describes how competition between two main Islamist organizations evolved and influenced the government organization, somewhat paradoxically diminishing the checks and balances of the secular state that expedited the government’s ability to purge. Kristin Fabbe examines the direct and indirect ways religion and government interact and asks who might fill the bureaucratic void left by the Gülen movement. The religion-state nexus not only influences domestic affairs in crucial ways but its effects also shape Turkey’s stature within the regional. Once heralded as a shining beacon of democracy in the region, Turkey is now sinking on many indices of democracy and freedom. Ekrem Karakoc illustrates the fluctuating popularity of the Turkish model since the Arab uprisings in other MENA countries. Unsurprisingly, Islamist parties tended to look up to the success of the AKP more than other groups. Yet the often-referenced secular/ Islamist dichotomy fails to get at the complexities of these movements and their relationships with power. The malleable use of identity is a recurring theme in this collection. Senem Aslan paints a fascinating picture of the diverse ways in which AKP leaders use public displays of crying. In a region where machismo and tough leadership dominate political discourse, this invoking of emotion and victimhood serves a unique purpose for a party that has been in power now for more than a dozen years. Kimberly Guiler also takes up this question of victimhood, examining the use of conspiracy theories in the wake of the July 2016 coup as the AKP attempted to centralize power and promote national unity. Esen Kirdiş shows how shifts in the AKP government’s identity can be measured by the shifts in its foreign policy, from moderate Western-facing at the beginning of its tenure in office, to increasingly more Islam and identity focused as its support and base grew and now to a nationalist orientation as its support is wavering. Lisel Hintz describes how the Republic Nationalist orientation of previous governments gave way to the Ottoman-inspired and Islam-focused inclusive politics that downplayed the importance of ethnicity, opening an all too brief window of opportunity for addressing the Kurdish question. In their analysis of female political representation, Abdullah Aydogan, Melissa Marschall, and Marwa Shalaby explore the effects of gender roles and norms on women’s nomination and winning at the local and national level offices. Counterintuitively, they find that national offices are more open to female representation than local levels. Expanding on the Kurdish question, Sabri Çiftçi illustrates the unique challenges to ethnic descriptive representation of Kurds in Turkey, especially in the context of conflict. The lack of demographic data remains a main challenge, but Avital Livny fills in the missing information gap with some innovative new survey data to measure Kurdish politicization. Şener Aktürk presents and analyzes several often-cited hypotheses about why the PKK ended its ceasefire in 2015, suggesting that foreign policy may have played a larger role than many believe. During this period of renewed war, Aysegul Aydin and Cem Emrence illustrate how curfews have been used not only as a means of civilian control but also selectively to punish areas that have voted for the Kurdish party and to entice voters who live in more competitive electoral districts. Güneş Murat Tezcür presents his unique dataset of Turkish foreign fighters leaving the country to join either nationalist struggles of Kurds or the religious call of ummah and caliphate, showing how these individuals are similar and very different and what this means for Turkish society. 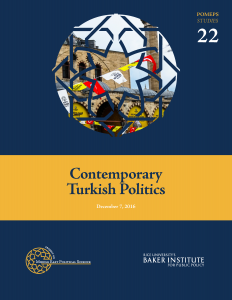 Useful for students, academics, and policy-makers alike, the pieces in POMEPS Studies 22 Contemporary Turkish Politics, offer a uniquely accessible yet nuanced analysis of a country in flux. Download it today.